Question: How much does a service dog cost? 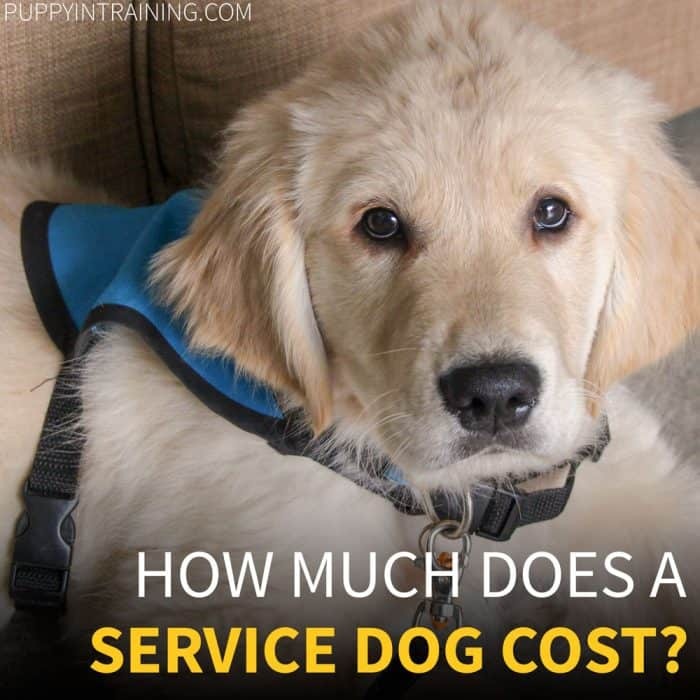 Answer: $25,000 is the total cost to raise and train a service dog including acquiring, training, placing, providing support, vet bills, food, supplies, and other miscellaneous expenses. I’m actually thinking at this very moment “how much will my next service dog puppy cost me?”. You see, I want to put together a budget for my next service dog puppy, then I’d like to raise enough money to cover all my service pup’s expenses. Lets start off by doing some research. Some of the largest organizations have numbers on their websites showing how much a service dog costs. This is from the CCI “Other Ways To Give” page detailing what specific donation amounts covers. The $50K “Sponsor A Team” donation level covers the entire cost of a service dog team. 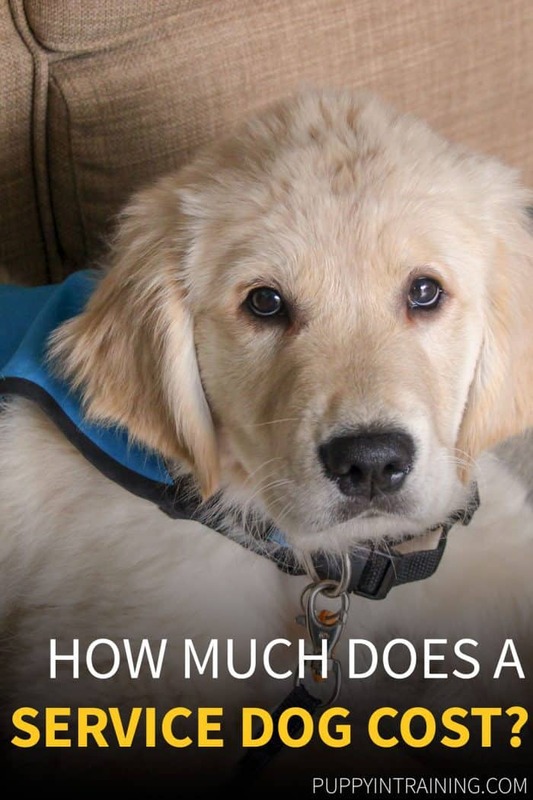 A visit to TLCAD’s Frequently Asked Questions page reveals the cost for one of their service dogs. …it costs our organization anywhere from $10,000-$28,000 per dog (depending on the length of time the dog spent in training). The estimated cost of each dog placement is in excess of $25,000. On the Summit Assistance Dogs application overview page you’ll find their cost for raising and training a service dog. The cost of acquiring, training and placing an assistance dog and providing follow-up support to our clients is about $25,000 per dog. Based on the above numbers we decided to take the median number for our quick and dirty answer at the beginning of this article. Now you might say $25K? $50K? Who could afford that kind of cheddar for a service dog? The good news is most of these organizations are non profit and receive generous donations allowing them to offer these dogs at little to no cost. However, there are some that do have to charge a substantial fee to help cover costs. Not all organizations are lucky enough to be fully funded for their dogs. We’ve been working with smaller organizations like Cascade Service Dogs that can’t always cover all the costs associated with raising and training a service dog. Our puppy in training, Dublin taking a nap. That’s the plan! That should give me a rough idea of how much my next service dog puppy will cost me. Here are the details for everything I think I will need to raise and train a service dog puppy from 8 weeks to 18 months old. Realistically the price for a Golden Retriever puppy varies a lot. Our Golden Retriever, Raven will have puppies in May. In the past her puppies have sold for $1,500 – $2,000 and if someone were to request the “pick of the litter” then the price would likely be $2,500. QUICK TIP: Some breeders will give you a discount if your raising a puppy to be a service dog (we got a discount when we got Archer). On the other hand we’ve heard other breeders not willing to sell their dogs because they don’t want them working as service dogs. Initial expenses for a puppy can vary a lot depending on where you get your puppy (rescue, shelter, breeder, etc.) and what they include in your “puppy care package”. PUPPY OPTIONS: $2,500 is definitely on the high end when choosing a puppy to be a service dog. My goal is to choose a puppy that I feel will have the best chance of becoming a service dog. In the future I’d like to work with shelter/rescue dogs to become service dogs. However, at this time I lack the skills to evaluate and choose good potential service dog candidates. To give you an example of difference in price: I paid $37 for Linus when I adopted him from the animal shelter. He had many traits that would have made him a great service dog except he would never have passed the Public Access Test. QUICK TIP: If you’re looking for everything you’ll need when you bring home a puppy check out our essential new puppy checklist. Disclaimer: We linked to the products we use and recommend in this post. We may earn money or products from the companies mentioned in this post. Dollar amount are estimates and used to get a guestimate for how much we would spend on a puppy. QUICK TIP: Chewy now offers pharmaceuticals so you can order items like Heartgard Plus by providing your pet and vet information. We plan on partnering with a service dog organization to complete the advanced training and team training with our puppy. We plan on donating approximately $5K to cover the cost for this part of the training. Now you’re probably looking at these numbers, totaling them up, and wondering why the cost for my service dog puppy is only $12,600? That’s a heck of a lot less expensive then the $25,000 we wrote in the first couple paragraphs. One small caveat I have not yet mentioned: Not all puppies become service dogs. I’m going to remove Berlin from the equation because she had the characteristics to be a service dog, but instead she will be like Raven (mother of service dogs). That leaves us with 2 working dogs and 2 career change dogs. Therefore by these small numbers 50% of the puppies we raised are service dogs. That means to get one working service dog I have to raise 2 dogs. WOW! That’s remarkably close to our quick and dirty number mentioned in the first couple paragraphs. MORE INFORMATION: Have you ever wondered how much does a guide dog cost? (dogs specifically trained for the blind). We answered that question several years ago on the blog and the answer is different then what you’d think after reading this post about how much a service dog costs. Why am I writing a post asking how much does a service dog cost? I want YOU to be a part of this journey that I started over 10+ years ago. If you haven’t already join our email list to get the most up to date news on our upcoming puppy. The money you contribute will be used to pay all of our service puppy’s expenses. We will detail how much money we receive and how much we spend here on the blog. If we exceed our goals and generate more money then the cost of our service dog puppy then we will donate the remaining amount to one or more of our favorite service dog organizations. Disclaimer: Not every puppy is meant to be a service dog. In fact many dogs are career changed before they start working. If this is the case with our puppy then we will donate the money from our “Sponsor A Puppy” fund to one or more of our favorite service dog organizations. Be a part of our next service dog puppy in training. Was this approximately how much you thought a service dog would cost? 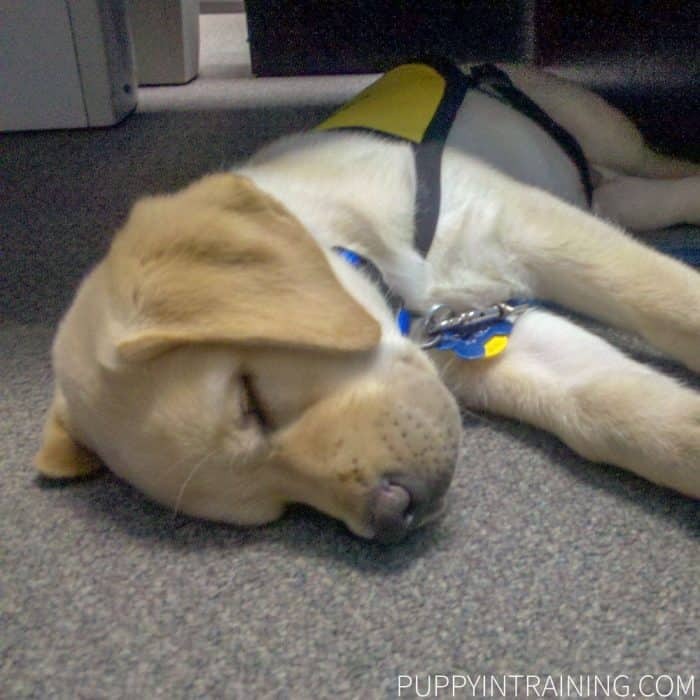 Are you ready to be a bigger part of our next service dog puppy in training? Tell us your thoughts, questions, and answers in our comment section below. I always knew it was expensive, but having it broken down like you did shows all the work that goes into raising a service dog. Lucky that you (and other puppy raisers) are volunteering your time to raise the puppy. If that time was factored in the puppy would be exponentially more expensive!! Great job! Puppy raisers are a big part of the process. If you factored in the time they take to teach basic obedience, good house manners, and socialization then the cost for a service dog would be much, much higher. In the state of Colorado you can now just register your dog and go buy a service dog vest. Many people take advantage of this unfortunately. This article is about real service dogs! Thanks! Unfortunately fake service dogs has been a problem here in California for quite sometime now and it can cause a problem for people with real service dogs. For everyone out there thinking about buying an SD vest for their pet dog, if you do not require a service dog please don’t parade your pet around as a service dog. Thank you. Thanks for this post! It’s amazing all of the small expenses that you don’t think of, it’s nice to see it all broken down like that. Service dogs are so important to the people they serve, thank you for all of your hard work with these valuable animals. I can’t wait to see the photos of Raven’s new puppies when they are born. She’s such a beautiful dog and good mother to them. Let me know how I can donate to your next service dog! There are a lot of costs associated with any puppy, but there are some added expenses when training a service dog. I’ll keep everyone up to date on ways to help our next service dog puppy here on the blog and through the newsletter.